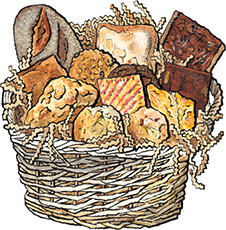 Sweet & Savory Bakery Basket for sale. Buy online at Zingerman's Mail Order. Gourmet Gifts. Food Gifts. Who says all pastries have to be sweet? We stuff our Sweet & Savory Bakery Basket with a loaf each of Roadhouse Bread, Chocolate Sourdough, and Pecan Praline Banana Bread, a sweet Lemon Scone and a spicy Ginger Scone, a raspberry-filled Patti Pocket hand pie, a walnut-studded Magic Brownie and a Sea Salt topped Pecan Blondie, an almond and orange scented brioche Bostock, a Ginger Jump Up Molasses Cookie and an Oatmeal Raisin Cookie.